On Monday, May 11, Geeks n Taps hosted another exciting sciencey-beer event called Epic Hookups, where 6 Foothills Brewing beers were paired with various chocolates from Black Mountain Chocolate and Twenty Degrees Chocolates. As we tasted the pairings, the “geeks” traveled from table to table entertaining and wowing participants with chocolate-related science experiments. The ultimate goal of the beer and chocolate pairings was to find a beer that complimented the chocolate or vice versa. Both beer and chocolate strive to balance sweetness and bitterness. The bitterness in beer comes from the hops, while the bitterness of the chocolate comes from the cacao. The challenge in pairing is to find the proper balance between sweetness and bitterness while finding flavor profiles that work in harmony. It is important to understand and recognize the flavors of both partners, the chocolate (or any other food) and the beer before just throwing two things together on a whim. Prior to the tasting, a small group (including Foothill’s pub brewer, David Gonzalez, Geeks n Taps founder, Pat Phelps, Brent Peters, chocolate maker for Black Mountain Chocolates, Nikki Miller-Ka of Nik Snacks, and yours truly, the Barrel Aged Babe) tasted a variety of Foothills brews in an effort to select the best pairings for the event. This meeting of the minds produced a great list of beer and chocolate pairings for Monday’s event. Yes, there is a method to the madness. It’s not a simple as piling a bunch of chocolate candies in your mouth and washing it down with a cold brew. There is actually a technique that will help you appreciate both flavors independently, as well as together. If you’re not handed a magical pairing pre-selected for your tasting pleasure, here are a few steps that will help! 1. Taste the beer. REALLY taste the beer. Appreciate and take note of the flavors you taste. 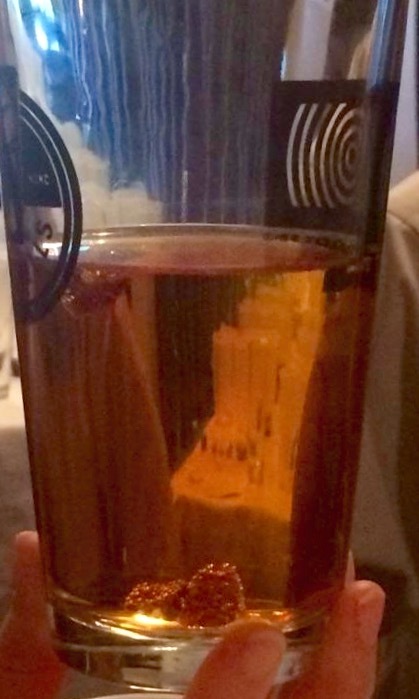 SMELL the beer–no, sniffing your glass is not reserved only for the wine-o’s. Take notice of how the beer feels in your mouth, how it starts, how it finishes, and what flavors may only be noticeable at mid-palate. Begin to recognize characteristics, such as hoppiness (bitterness), alcohol content, and amount of carbonation. The ability to recognize and appreciate these factors will come with time and practice. It will also come with an increased mindfulness of these characteristics. 3. Discuss. If you’re tasting with friends, share your thoughts. Someone might mention a flavor they noticed that you did not. In that case, sample again and see if you can also pick this flavor up. Tasting should be a fun experience, so share your thoughts and observations with friends! 4. Use what you’ve learned and ENJOY!! Now that you have an idea of how the beer and chocolate taste independently and you’ve talked with friends and perhaps recognized new characteristics, it is time to taste. First, try taking a sip of beer, then placing a small piece of chocolate in your mouth. Notice how the flavors either compliment one another, or possibly repel one another. Believe me…if you’ve found flavors that clash, you’ll know it! After taking mental note of this sequence of flavors, try the reverse. Place a small piece of chocolate in your mouth and slightly chew, then pour beer over it. The flavors will surprisingly be a little different. The fats in the chocolate change your mouth slightly by coating it, so you may notice the flavor pairing tastes slightly different. Twenty Degrees OMG!, a caramel truffle topped with sea salt, was paired with Foothills People’s Porter. Porters generally have a malty, chocolate flavor with notes of caramel and an ever-so-slight herbal bitterness. The caramel and chocolate paired nicely with the porter, however the sea salt atop the truffle was very overpowering. At times, I felt like I had a mouth full of salt (but keep in mind, I am not a salt lover). This pairing did not work for my palate. Pairing 2: Twenty Degrees Basil Orange + Hoppyum–MY FAVORITE!! Twenty Degrees Basil Orange, a truffle with an oozy orange-basil fondant inside and topped with a small piece of candied orange peel, was paired with Foothills’ unofficial flagship beer, Hoppyum. The creaminess of the chocolate provided a nice balance to the citrusy Simcoe hop of the Hoppyum. This pairing is truly a match made in heaven!! Hops include a blend of Cascade, Centennial, and Columbus; with a dry-hopped finish of Simcoe hops. But alas, Hopium was also not an appropriate name, as the word “opium” is included in the word and lest we not mislead the public! And finally, Foothills decided on the new spelling of Hoppyum. A great name for a great beer that is both Hoppy and YUM!! 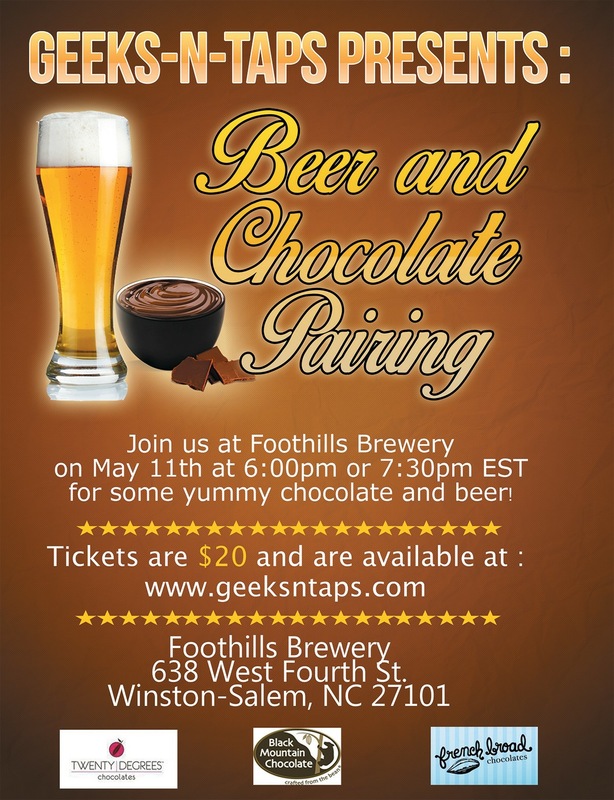 The Black Mountain Milk Chocolate, which is made from goat milk and 70% Cacao Dominican chocolate, was paired with Foothills seasonal Doppelbock, part of their High Gravity Lager series. At a hefty 8%, the Doppelbock was an excellent match for the creamy and slightly bitter milk chocolate. The creamy, mouthcoating taste of the milk chocolate paved the way for the malty Doppelbock. This pairing was a very close second for my favorite! The Black Mountain Milk Chocolate, which is made from goat milk and 70% Cacao Dominican chocolate, was paired with Foothills Strawberry Blonde Ale, a crisp cream ale with pureed strawberry added. Milk chocolate and strawberries…a match made in heaven, right!!?? OR NOT! This pairing was selected to demonstrate the cacophony of flavors that can exist when things seem like they might go together, or the pairing is not well thought out. If you would like to taste an example of what NOT to do, go for it. Your taste buds will not be happy! Black Mountain’s Dark Chocolate, made from 70% cacao, was paired with Foothills Maibock. Maibock is Foothills’ spring seasonal brew and has floral, lemony notes with toasted-bread maltiness to balance the flavors. Another excellent complimentary pairing! Black Mountain’s Dark Chocolate with Sea Salt, made from 70% cacao, was paired with Foothills Hoppy Medium. 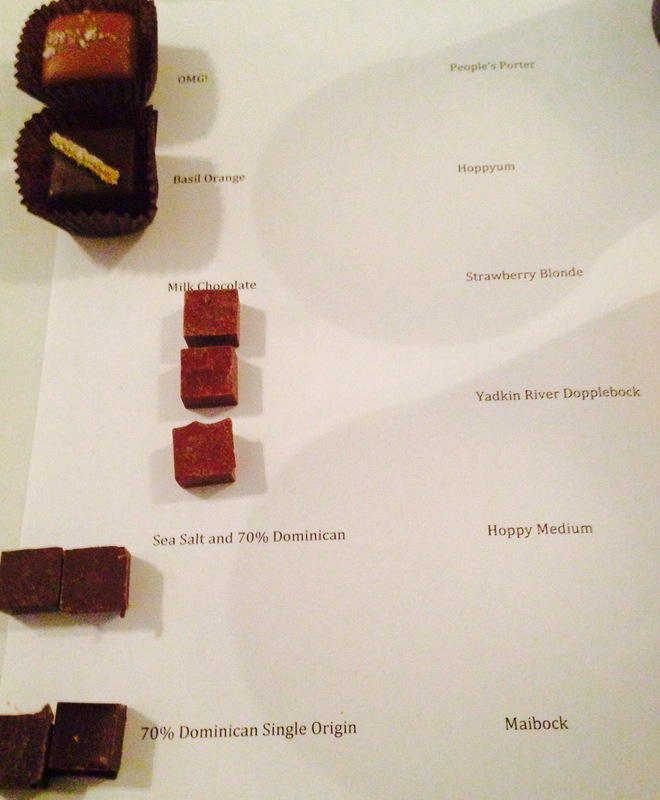 The sea salt in the chocolate was subtle, so it did not overpower the chocolate or the pairing. Hoppy Medium, another seasonal brew from Foothills, is an Imperial Brown Ale which is exactly as it sounds–a hoppy medium between an IPA and brown ale. This unique beer paired alongside the dark chocolate with sea salt created a harmonious blend of malty and bitter goodness. 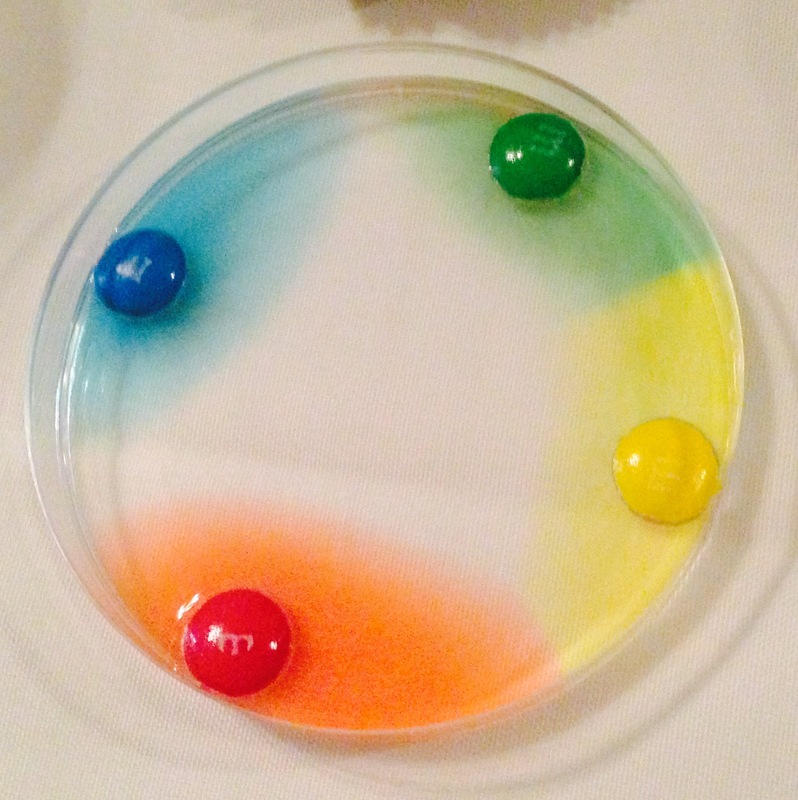 M&M Science Experiment: What happens when you place an M&M of each color in a Petri dish and cover with water? 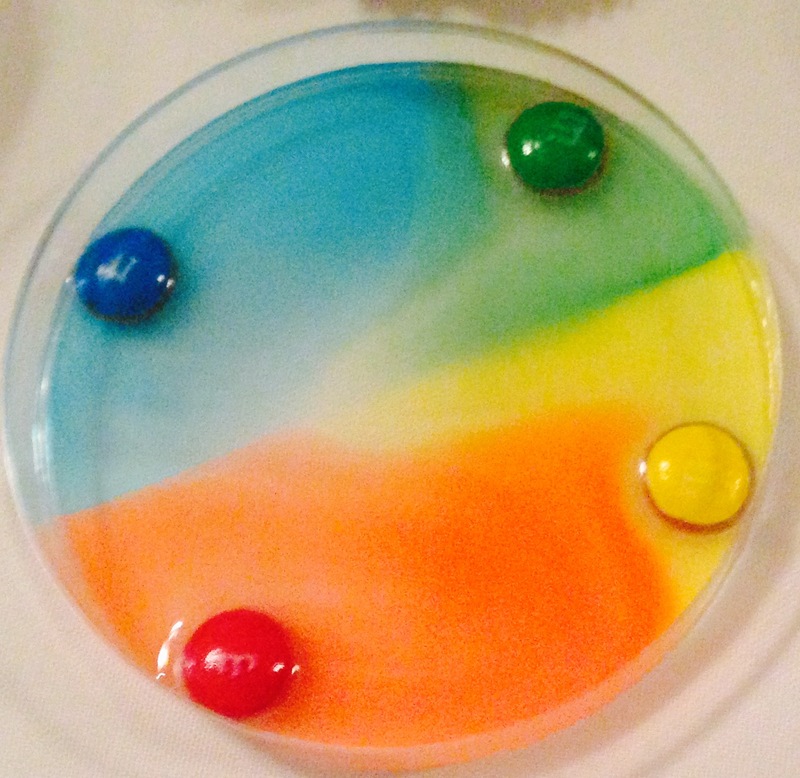 One M&M of each color was added to a Petri dish of water and our table made predictions as to what would happen. Hypotheses included: colors will all mix together, the color will stay on M&M, and the M&Ms will melt. 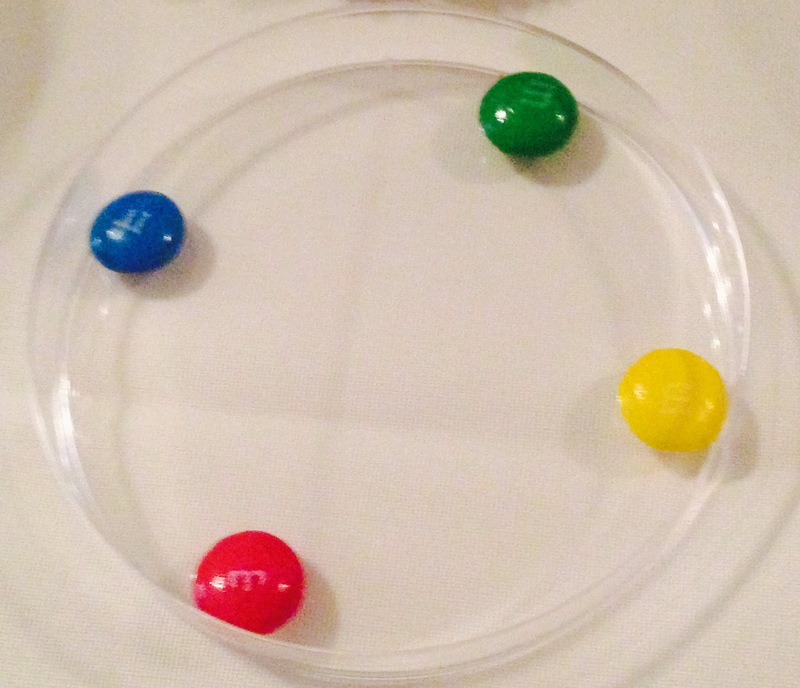 After about a minute…the colors began to migrate to each side of the M&M. After about 4 minutes, the colors formed their own barriers to one another. The sugar (AKA color) from the M&Ms dissociated from their chocolaty centers. The osmotic pressure exerted from each sugar (color) met the pressure from its neighboring sugar (color) until the osmotic pressure equalized. Once the pressure equalized, the colors no longer needed to move in order to reach equilibrium. The M floated to the top of the water. This is due to the composition of the M itself. It is made of cocoa butter, which caused it to float to the top based on the relative densities of the water and fat. In order to learn more about the make-up of chocolate, we dropped a few chocolate squares into a glass of beer. 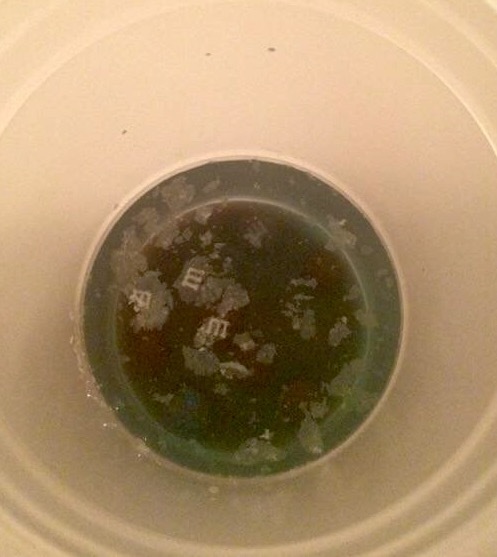 As the squares settled into the beer, bubbles began to form on the exterior of the squares. The bubbles that escaped from the chocolate were gas bubbles trapped in the chocolate. The bubbles continued to grow larger until eventually all the gas was released and the chocolate square floated to the top. The dark chocolate squares took longer to float because dark chocolate is more dense than the milk chocolate. Which chocolate will melt first–white, milk, or dark chocolate? 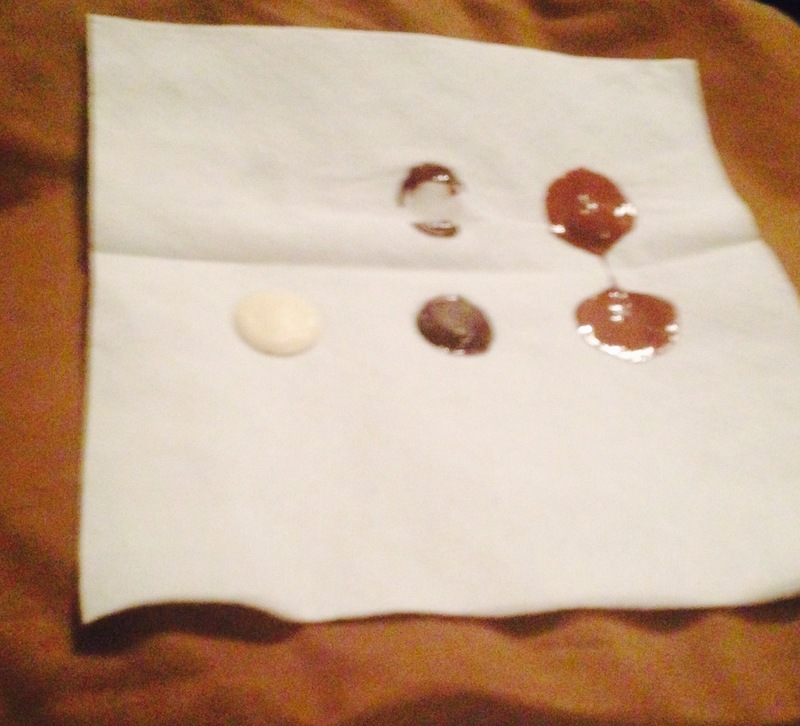 In order to determine which chocolate would melt first, we placed one piece of each chocolate atop a heating pad. The table predicted that the white chocolate would melt first because white chocolate is not chocolate at all (MYTH debunked below); however the milk chocolate melted first. The faster melting point was based on the makeup of the milk chocolate and amount of fat contained in milk chocolate. FACT: White chocolate DOES exist! 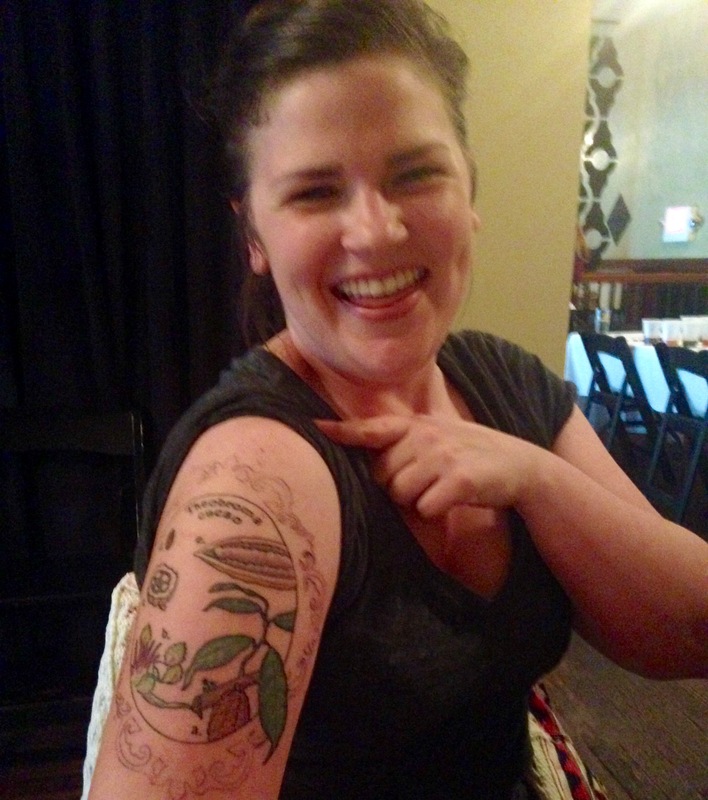 I was lucky enough to share a table with Black Mountain Chocolate’s Chocolatier, Megan Peters. She is an amazingly talented and knowledgeable pastry-chef-turned-chocolatier and daughter of chocolate maker, Brent Peters. Megan informed the table that white chocolate really DOES exist, however it is extremely rare to find real white chocolate. The hunt is now on! Challenge accepted! Megan LOVES her Cacao Beans! Brent Peters, chocolate maker for Black Mountain Chocolates, gave us a Cliffs-notes version of the process of chocolate making as we tasted. 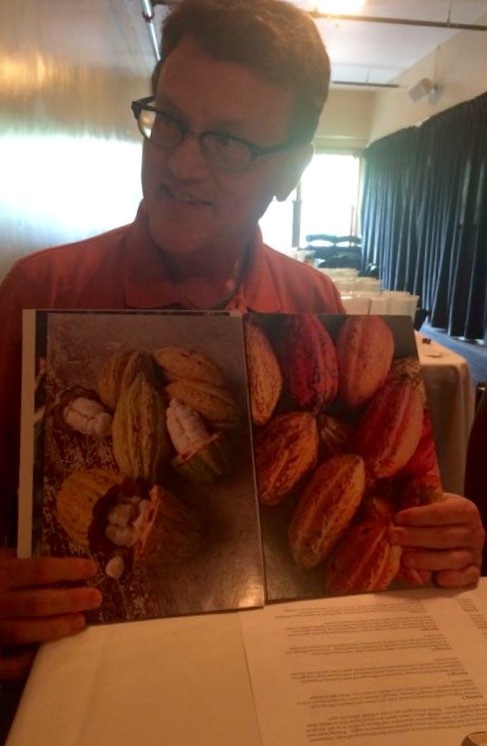 I learned several new facts about chocolate and the cacao seed. When first harvested, the cacao seed actually tastes more like an olive than chocolate. Long ago, Cacao seeds were very valuable assets and were actually used as a form of currency. Then…..Brent laid it on us….CHOCOLATE AND BEER ARE COUSINS!! He explained this familial connection by explaining the process of beer making alongside the process of chocolate making. There were several parallels in the two processes. Yeast is used in the processing of both chocolate and beer. Yeast creates the heat necessary for fermentation. The fermentation process of chocolate turns the olive flavor of the cacao to the chocolate flavor we know and love. If this sounds like fun to you, come out to the next Geeks n Taps event! 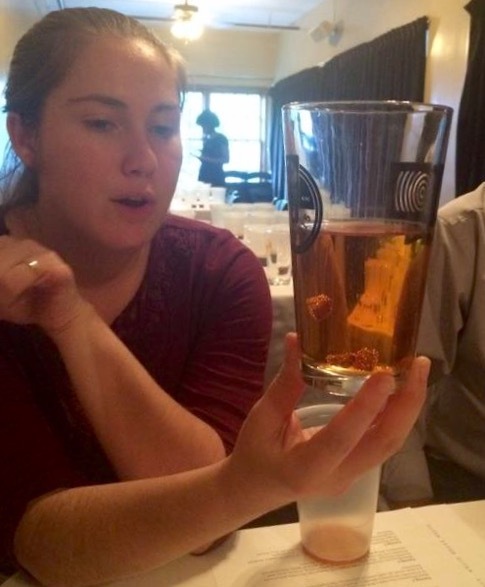 Beer + Science = FUN!! 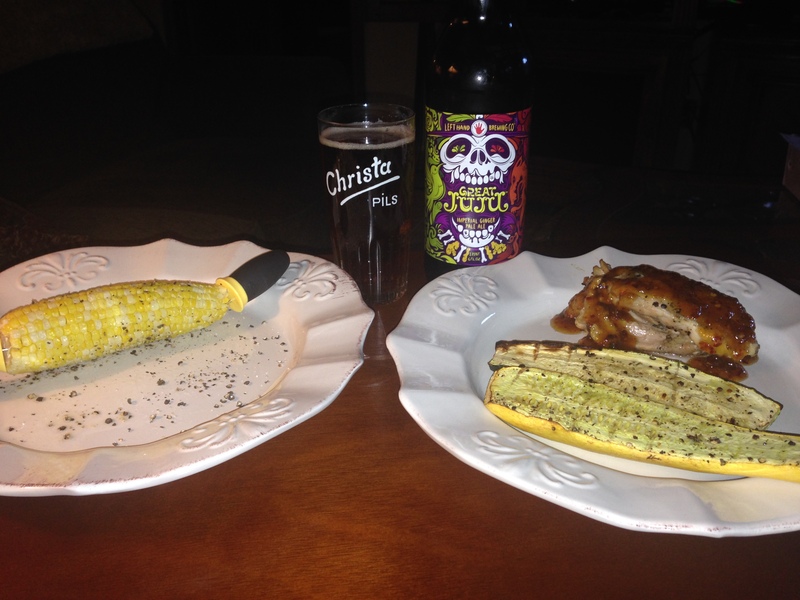 Do you consider which beer to drink with an everyday dinner? If not, you could be missing out on the ULTIMATE palate pleaser! With the growth of the craft beer market and the farm to table movement, there are more options than ever to combine the intricate flavor profiles of craft brews with amazing menus featuring local produce and fresh herbs. Pairing beer with food is much like pairing wine and food. It is important to consider the flavor profiles of both the food and the beer–factors such as spice, fruit, and weight are important when thinking about the meal and the accompanying beverage. You brew of choice should compliment, not overpower, the meal. 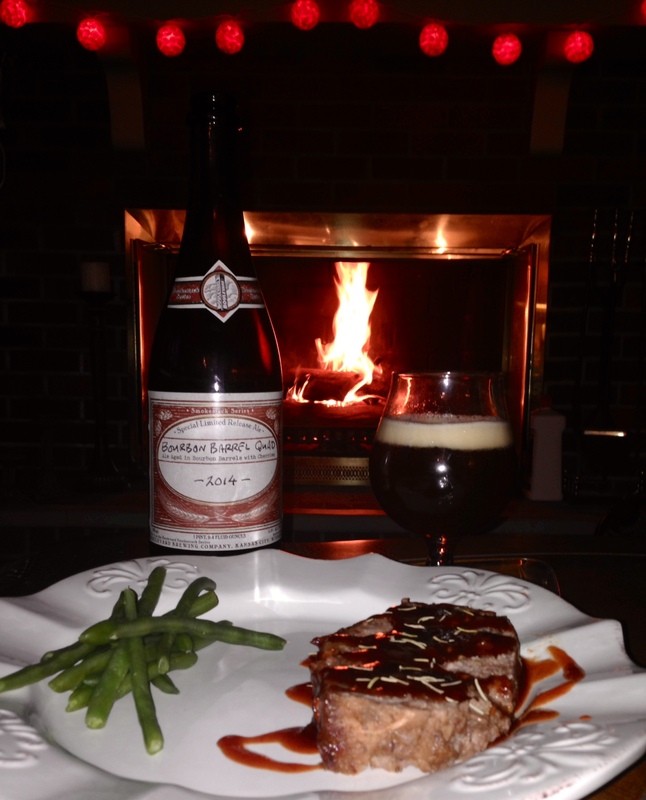 I paired a bourbon glazed meatloaf with a Bourbon Barrel Aged Quad with cherries a few months ago. This was an amazing combination! 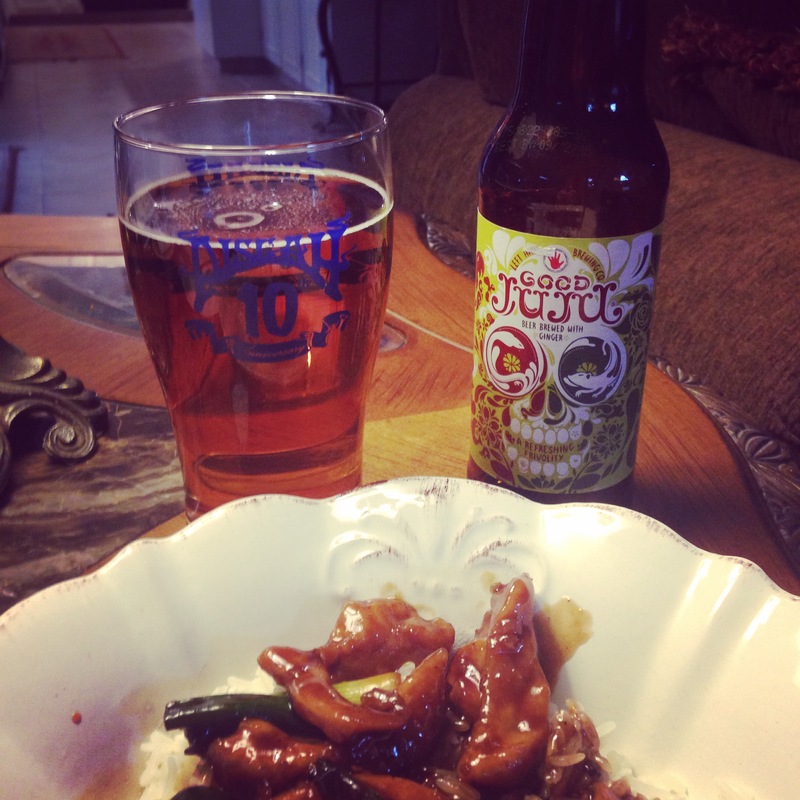 See more about this pairing on my National Spicy Food Day post. I always try to keep a good variety of beer in my beer collection, and I appreciate all beer styles. This makes it easy for me to consider a recipe, consider beer styles, and choose a perfect pairing. I was in the mood for Chinese, so I pulled out a recipe from my GIGANTIC binder-o-recipes and selected a Mongolian Chicken recipe for dinner. I am a big fan of Mongolian beef, so I decided to give the chicken a whirl. The recipe was super easy, which is always a plus! It also gave me a chance to grab some ginger and green onions from the local farmers market. I was planning to use both of these to propagate my own ginger root plant and green onion supply at home. I will keep you posted on my ginger growing as it progresses. I chose Good Juju to pair with this dish because they both contain ginger. Ginger can be a powerful spice at times and overpower both a beer or a meal, but in this case, the amount of ginger in both was well-balanced. The dish did turn out a little salty, so in the future, I will use low-sodium soy instead of regular sodium. If you like salt, use the regular soy, however be aware that it may overpower your dish. The Good Juju was a great balance, with a slight malt and fresh, subtle hops–definitely a great spring beer! 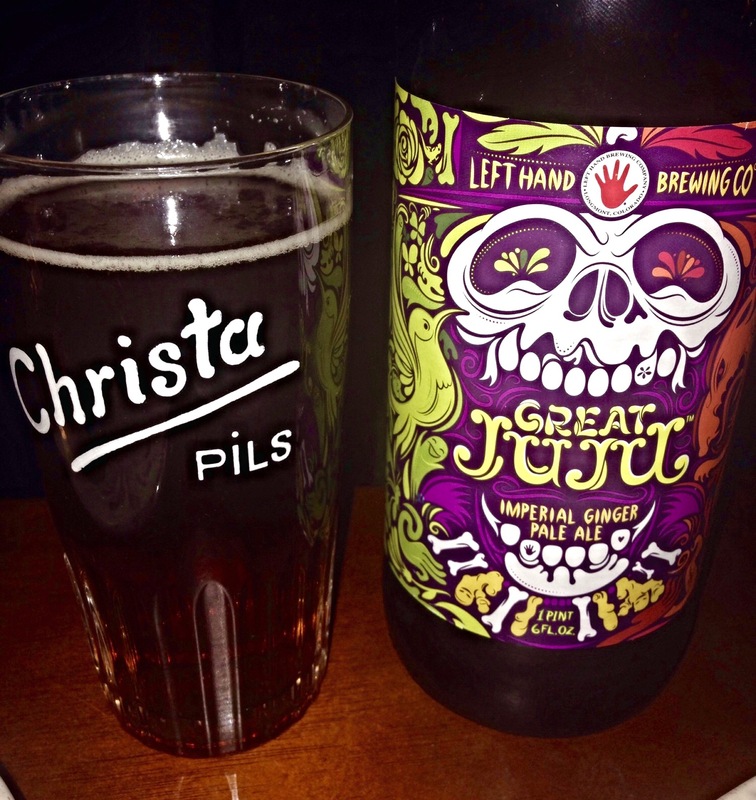 Left Hand Brewing also just released Great JuJu, which is…..you guessed it! An Imperial Ginger. This beer boasts an ABV of 7.2% and is equally well-balanced as its younger sibling, Good JuJu. Great JuJu is a little heavier in body, so take this into consideration when enjoying it with a meal. I paired this beer with Orange Balsamic Grilled Chicken Thighs and some spring veggies from the Jamestown Farmers Market. Using dark meat chicken was a great idea with this beer, as it was able to hold up to the slightly heavier body of this Imperial. The spice of the orange balsamic glaze (influenced by the addition of crushed red pepper) was a perfect compliment for the spicy ginger in the Great JuJu. Another great match! Monday,May 11, I will be attending Geeks-n-Taps Epic Hookup event at Foothills Brewery. The event will feature 6 beer and chocolate pairings, along with several cool science experiments involving chocolate and beer. If you haven’t gotten your ticket yet, click HERE and use code YUM to get $7 off. This is an event you won’t want to miss!! I was fortunate enough to be invited to be a part of the inner circle of geeks and geniuses who created these pairings. I’m pretty proud of our pairings. You’ll never look at chocolate and beer the same!